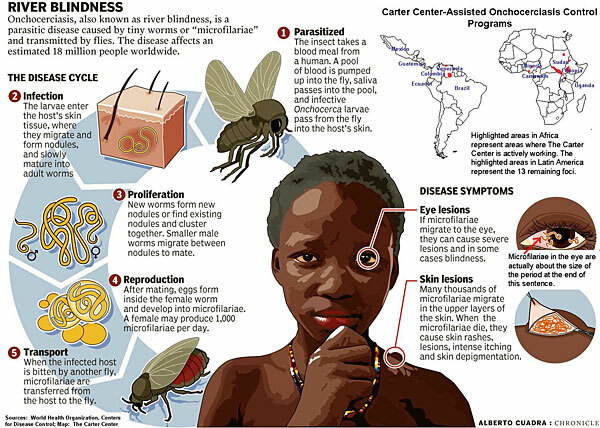 Onchocerciasis, otherwise known as “River Blindness,” is a filarial infection caused by the nematode Onchocerca volvulus that can lead to visual morbidity via multiple mechanisms including chorioretinitis, uveitis, and sclerosing keratitis. It is transmitted by the bite of an infected blackfly (genus Simulium). Because the insect that spreads the disease breeds and lives near fast-flowing rivers and streams. It is manifest systemically but is best known for its cutaneous and ocular pathologies. More than 99 percent of all cases of onchocerciasis and onchocerciasis-related blindness are found in the WHO African Region. Isolated areas of the disease also exist in Yemen and in six countries in Central and South America. In areas where the African Programme for Onchocerciasis Control (APOC) has been present since 1995, WHO estimated that in 2008 about 26 million people were infected with onchocerciasis, of whom 265,000 were blind and 746,000 were visually impaired. People who live in rural areas near fast-flowing rivers and streams where there are Simulium blackflies are most at risk of acquiring onchocerciasis. During a blood meal, an infected blackfly introduces third-stage filarial larvae into the skin of the human host, where they penetrate into the wound and subcutaneous tissues. They develop into adult worms called filariae. Filariae commonly reside in nodules in subcutaneous connective tissues, where they can live for approximately 15 years. In nodules that contain numerous male and female worms, the female worms are capable of producing larvae, called microfilariae, for approximately nine years, producing an average of 1,600 microfilariae per day. The microfilariae have a life span that may reach two years. They are occasionally found in blood, urine, and sputum but are typically found in the skin and in connective tissues. To repeat the transmission cycle, a blackfly ingests the microfilariae during a blood meal. After ingestion, the microfilariae migrate from the blackfly’s midgut to the thoracic muscles, where the microfilariae develop into third-stage infective larvae. The third-stage infective larvae migrate to the blackfly’s proboscis and can infect another human when the fly takes a blood meal. The most nodule, can live for up to 15 years. Females in subcutaneous nodules can reproduce for about nine years, producing an average of 1,600 microfilariae per day. Microfilariae, which have an average life span of 13 months but may live for up to two years, leave the nodules and migrate throughout the body; most eventually die. 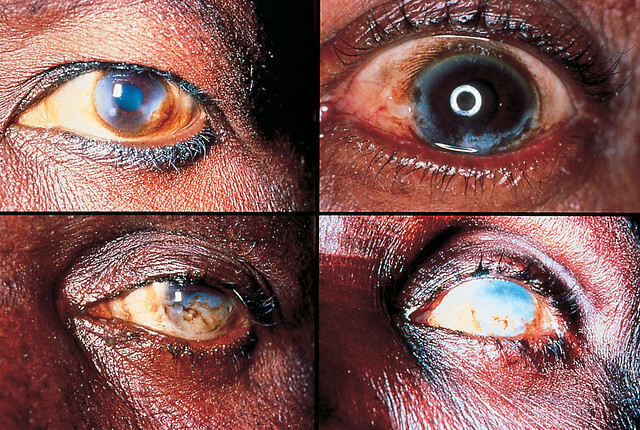 Depending on their location, dying and dead microfilariae produce symptoms typical of the disease: itching and lesions of the skin and the eye. The multiple sequelae result from direct invasion of the nematodes, which leads to induction of inflammation in the infected host. Eventually, these inflammatory changes can lead to blindness through corneal sclerosing keratitis, secondary glaucoma, cataracts, chorioretinitis, and optic atrophy. While still alive, O. volvulus cause very little in terms of pathology. The adult worms are protected by the fibrous skin nodules in which they reside, and the microfilariae (through some unknown mechanism) are non-immunogenic. It is when they die that they cause an immune response. Antigens that are released by dead or dying organisms cause a T-helper cell (TH2) response, which leads to the release of interleukins, resulting in the influx of neutrophils and eosinophils, and the production of antibodies by plasma cells. These inflammatory responses lead to corneal opacification. Specifically, it is thought that the sclerosing keratitis is an effect of modification of ICAM-1 expression and production of IL-4 and IL-14. Adult worms remain in subcutaneous nodules, limiting access to the host's immune system. Microfilariae, in contrast, are able to induce intense inflammatory responses, especially upon their death. Wolbachia species have been found to be endosymbionts of O. volvulus adults and microfilariae, and are thought to be the driving force behind most of O. volvulus morbidity. Dying microfilariae have been recently discovered to release Wolbachia surface protein that activates TLR2 andTLR4, triggering innate immune responses and producing the inflammation and its associated morbidity. The severity of illness is directly proportional to the number of infected microfilariae and the power of the resultant inflammatory response. Skin involvement typically consists of intense itching, swelling, and inflammation. O. volvulus involves all ocular tissues. Initially, it can involve the eyelid and conjunctiva, leading to eyelid nodules and edema, chronic conjunctivitis, chemosis, and phlyctenule-like kerato-conjunctival lesions. Then, by direct invasion, microfilariae infect the cornea and sclera. Corneal manifestations include fine interpalpebral sub-epithelial punctate lesions. These “snowflake opacities” can lead to a chronic sclerosing keratitis and discrete nummular scars with stromal edema, corneal infiltration, and neovascularization. It is the sclerosing keratitis that contributes to this nematode's permanent blinding effect. The microfilariae invade the iris and the ciliary body, leading to iridocyclitis that can be severe. This can result in correctopia, iris atrophy and extensive synechiae that can result in secondary glaucoma, as well as early cataract formation. Posterior chamber involvement can include chorioretinal lesions. Peripapillary chorioretinitis can result in optic nerve dysfunction secondary to optic nerve edema and optic neuritis, eventually leading to optic atrophy. The Mazzotti reaction, first described in 1948, is a symptom complex seen in patients after undergoing treatment of onchocerciasis with the medication diethylcarbamazine(DEC). Mazzotti reactions can be life-threatening, and are characterized by fever,urticaria, swollen and tender lymph nodes, tachycardia,hypotension, arthralgias, oedema, and abdominal pain that occur within seven days of treatment of microfilariasis. skin patch test is used to confirm the diagnosis. The drug patch is placed on the skin, and if the patient is infected with O. volvulus microfilaria, localized pruritus and urticaria are seen at the application site. Typically, patient present with cutaneous symptoms including itching and dermatologic changes years before the onset of ocular symptoms. These symptoms can be very severe, leading to excoriation, bleeding, and even suicide. In terms of ocular disease, patients will classically complain of an insidious onset of decreased vision, eye redness, eye pain and photophobia related to iridocyclitis, and perceived corneal changes related to the sclerosing keratitis. These changes often manifest in the patients’ 4th to 5th decade. Global preventative efforts are currently concentrated in population-based prophylactic treatment through programs such as the African Programme for Onchocerciasis Control (APOC). Community-wide ivermectin administration (Mectizan®, donated by Merck) and vector (black fly) control have been the mainstay of these programs, which have been markedly successful. These measures have resulted in an estimated 35 million people no longer being at risk for infection, two million infected people who have been appropriately treated, and over 200,000 people in whom blindness has been prevented.4,7,11 However, in some highly endemic areas, more than three decades of annual treatment are still needed in order to effectively control this preventable disease. Individual prevention can include protective measures to avoid contact with the black flies in endemic areas, including avoiding areas in which the disease is systemic, using insect repellent and wearing appropriate clothing. Diagnosis is made clinically with confirmation by superficial skin snip biopsies. Newer adjuvant tests including PCR amplification and serology have largely supplanted the historical Mazzotti test . The majority of patients would have lived in endemic areas. The classic history includes preceding dermatologic lesions associated with severe pruritis, which leads to ocular signs and symptoms several years later. Other systemic symptoms result from invasion of the CNS, viscera, and urinary systems. Slit lamp examination can be used to visualize the ocular findings associated with Onchocerciasis. Occasionally, the microfilaria in the anterior chamber or cornea can be visualized, aiding in diagnosis. The nematodes can be seen using retro-illumination as S or C-shaped, fine motile elements. Patients are asked to sit with their head between their knees for at least 2 minutes in order to mobilize the microfilariae that are suspended in the anterior chamber, increasing the sensitivity of this test. In Sierra Leone, community drug distributors stand with poles they use to measure the height of participants during a mass drug administration. Height is used to determine the proper treatment dosage for participants. For example, an individual who reaches the white area of the pole, which has one dot, would receive one dose of ivermectin. On a global level, sustainable mass drug administration of ivermectin is currently the primary control strategy for onchocerciasis. Merck & Co., Inc. has established a generous program, called the Mectizan Donation Program, to provide free drugs to any governmental or nongovernmental organization that demonstrates the need and the capability to distribute ivermectin. WHO programs include the OCP, the APOC, and the OEPA. OCP was officially closed in December 2002 after virtually stopping the transmission of the disease in all the participating countries except Sierra Leone, where operations were interrupted by a decade-long civil war. APOC has been working with neglected tropical diseases since 1995 and is currently assisting countries in Africa outside the original OCP area in West Africa, establishing sustainable national programs for ivermectin distribution. In most APOC countries, vector control, usually ground larviciding using environmentally safe insecticides, is not feasible or cost-effective. OEPA aims to eliminate clinical onchocerciasis and interrupt transmission using biannual ivermectin treatment to cover 85 percent of affected communities.